Australian Matt Ebden is playing the most consistent tennis of his life after crashing out of the top 500 in 2016, and he came back from a first set lost 6-1 to world number 51 Jan-Lennard Struff to beat the German in four sets in the first round. Ebden went 19-22 in the 2018 season during which he won a Challenger event in South Korea and he competed well for Australia at the recent Hopman Cup. The 31-year-old world number 48 has faced Rafael Nadal once before, losing in straight sets at Queens 2011, whilst he has some significant top 20 scalps recently, including Dominic Thiem, David Goffin and John Isner, the latter of which he beat at the Australian Open last year. 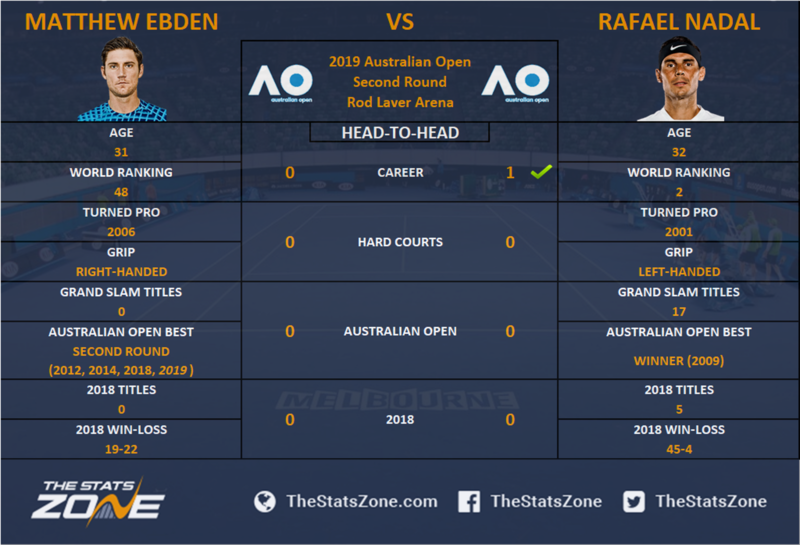 World number two Rafael Nadal is seeking his second Australian Open title after winning the tournament ten years ago in 2009 and faces his second Australian opponent in Matt Ebden after beating James Duckworth in straight sets. With an astonishing 45-4 record last year, Nadal is one of the form contenders coming into this season but has historically pulled out of hard court events, including the US Open and Australian Open last year, through injury. Nadal’s only losses not through retirement In 2018 came at the hands of Novak Djokovic, who went on to win Wimbledon, and notably Dominic Thiem at the Madrid Masters; a player that Ebden beat last year. A second round Grand Slam tie on home soil for Australian Matt Ebden must be the stuff of dreams, and his fight from insignificance to the top 50 in recent years deserves nothing less. However, his opponent is Rafa Nadal, who’s greatest foe at a Grand Slam before the semi-finals is his own fitness. Ebden will have the crowd on his side at the Rod Laver Arena, but Nadal’s dismissal of fellow compatriot James Duckworth in the first round can be a model for this match. Nadal in straight sets.